Climate change research has grown considerably in the past decades as the scientific community strives to understand how ecosystems will change in the future. In terrestrial systems, much of this effort has been focused at understanding the response of the vegetation community to climate change, stemming from a long-held view that these systems are controlled predominately by bottom-up processes. In this lab, we view terrestrial systems as being controlled by both top-down and bottom-up processes, and integrate this conceptualization into our climate change research. Thus, our research focuses on the effects of climate change on predation and herbivory (top-down), as well as plant productivity (bottom-up). Bryan will be examining the effect of local adaptation to temperature of a generalist grasshopper on the structure and dynamics of old-field systems in the summer of 2013. Bryan will be studying two populations of Melanoplus femurrubrum separated by 450 km of latitude—one in the Yale-Myers Research Forest in CT and one in the town of Craftsbury, VT. He will conduct a reciprocal transplant field mesocosm experiment, transplanting CT grasshoppers to cages in VT and vice versa. Half of the field mesocosms will be experimentally warmed to simulate global warming. At the conclusion of the field experiment, Bryan will be harvesting and sorting aboveground plant biomass from the cages into two functional groups—carbohydrate-rich forbs and nitrogen-rich grasses—and calculating the grasshoppers’ effect on each. Metabolic rate of grasshoppers will be measured and compared, as will survival rate of the two populations under ambient and warmed conditions. 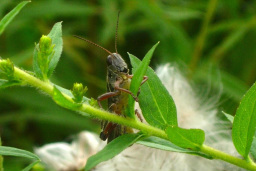 Bryan’s hypothesis is that grasshoppers from VT will exhibit a more plastic response to warming than grasshoppers from CT, which will be evidenced by an increase in metabolic rate and a diet shift towards carbohydrate rich plants. Bryan’s study has the potential to shed light on how ecosystems will respond to warming and highlight the role that local adaptation of organisms plays in an ecosystem’s response. Human activities and changing climate are altering the structure and function of ecological communities. These dynamic landscapes pose new challenges for conservation practitioners to map species with changing community composition. The aim of this project is to identify the extent to which traditional adaptation approaches, directly linked to biodiversity, are congruent or divergent with a newer adaptation approaches focused on protecting geophysical complexity and restoring connectivity. Based on these results, we will provide an evidence-based approach that integrates multi-trophic interactions into ecosystem-level conservation. The insight from this approach will be used to devise better ways for conservation to be sensitive to the idea that there is a rich diversity of species due to unique aspects of their biology and their interactions with their surrounding environment. We will illustrate how this proposed approach will contribute to an ongoing regional land-acquisition project in the ecological diverse and densely populated northeastern region of the USA. Climate warming is projected to act as a stressor on organismal physiological temperature sensitivity, causing net carbon losses from ecosystems to the atmosphere at rates proportional to plant and heterotroph biomass. Yet, temperature is also a fundamental control on community processes, causing species to adjust their physiological performances and their interaction strengths, with attendant effects on community composition. Organisms alter their physiology in response to other stressors, such as predation risk, and these responses also affect ecosystem carbon dynamics. Thus, warming effects on the strength of species interactions – such as those between herbivores and predators – have the potential to exacerbate or mitigate the effects of rising temperature on ecosystem carbon cycling. This research will involve a factorial design that crosses a warming treatment with a top-predator manipulation to decouple and thus quantify the contributions of stress from predation risk and stress from warming on whole ecosystem carbon dynamics. Measurements include net ecosystem productivity – the balance between photosynthesis and organismal respiration – and tracking the pathways and transfer rates of carbon in the system using 13CO2 pulse-chase approaches.